Clifford Carwood “Lip” Lipton (January 30, 1920 – December 16, 2001) was a United States Army officer in the 101st Airborne Division, 506th Parachute Infantry Regiment, 2nd Battalion, Easy Company. Carwood joined the Army in 1942 as a Private. On the battle fields of Europe he was promoted to Company First Sergeant and ultimately was given a battlefield commission to Second Lieutenant. He said “it was the greatest honor ever awarded” to him. Carwood was born and raised in Huntington, West Virginia. His father died in an automobile accident when he was ten, and he was depended on by his mother, as the eldest to be the “man of the family”. After completing one year at Huntington’s Marshall University, he left school due to financial troubles at home and went to work in war-related production. After reading an article in Life Magazine on the difficulty of paratrooper training, and how you had to be the best to be one, Carwood enlisted and joined the paratroops in 1942. Carwood shot through the ranks of the company eventually becoming the Company First Sergeant shortly after D-Day (Operation Chicago/Overlord). Carwood was always keeping the men’s spirits high, and pushed them to their full potentials. This was recognized by the officers of Easy, the 101st, and the 506th. Even closer to the D-Day invasion of France, Carwood and several other non-commissioned officers decided to turn in their stripes, and requested they be transferred to another company. This was because the non-commissioned officers believed their leader, then Captain Herbert Sobel to be an incompetent leader. Carwood and the others were given some verbal abuse but were otherwise left unpunished (Sgt. Myron Ranney was demoted to Private, and another man was transferred out of the company, but the NCOs were not punished). Carwood Lipton was the jumpmaster of one of the C-47 Skytrains that the paratroopers used to jump into Normandy. Lipton dived into Normandy and was able to rendezvous with then First Lieutenant Richard Winters, Easy’s executive officer, and several other men from the 101st, and two more from the 82nd Airborne Division. They were later joined by several more Easy members, and worked their way just south of their objective of Carentan. Lipton was teamed with Private Myron Ranney during the Brecourt Manor Assault, where Easy Company was assigned the task of destroying four 105 mm howitzers (they were originally thought to be 88 mm, but it was discovered that they were 105 mm when they got there.) that were firing down on Utah Beach. Easy Company managed to destroy the four guns, and Lipton was awarded the Bronze Star for his actions. Lipton was involved on the assault on Carentan and was injured by shrapnel. He was awarded the Purple Heart. Carwood was out of Easy for a few days and happily returned as soon as possible. Around the time Operation Market Garden was scheduled to take off, Easy Company’s slowly depleting ranks became too much, and were refilled by replacement soldiers. Carwood Lipton is remembered by many of the replacement veterans as being one of the very few men who immediately accepted them as true soldiers. He helped the replacements along in Operation Market Garden. Lipton was with Easy when they liberated Eindhoven, and was part of an advanced scout team that scouted the bridge ahead of the rest of the Company. Lipton was fighting with the Easy when they attempted to take Arnhem, but had to pull-out because of the German defences there. Lipton ran like a madman through part of the town that was swarming with German soldiers to reach all of the spread out soldiers and pass on the word that they were pulling out. A small team of scouts were on the crossroads in Holland when a member of their squad was badly wounded by a German Model 24 Steilhandgrenate and Easy was called to action. They were assigned the task of destroying any remaining Germans at the crossroads. Lipton was not among the original assault team of around ten men, but joined up the next morning with Easy, bringing the rest of the company. Easy Company managed to destroy over two companies of SS situated at the Crossroads due to launching a surprise attack on their position. Operation Pegasus was a small, and potentially low-risk operation where Easy Company were to cross the river on boats supplied by Canadian Engineers, and bring back over 140 British Red Devils who were trapped when Easy pulled back from Arnhem. Lipton and First Lieutenant Heyliger oversaw the Operation to success. Under the new command of Second Lieutenant Norman Dike, a leader perhaps worse than the Company thought Herbert Sobel was, Lipton gave the men hope in the Ardennes Forest overlooking Foy, and became the unofficial commanding officer due to Dike’s incompetent leadership. After Easy Company’s assault on the town of Foy, Carwood was told he would be given a battlefield commission as a Second Lieutenant. 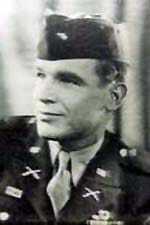 Carwood Lipton received his official battlefield commission as a Second Lieutenant in Haguenau. Lipton later witnessed the horrors of the Holocaust at Landsberg, where he and the rest of Easy Company liberated the camp. Lipton assisted Easy in the capture of the Nazi’s symbolic home, Berchtesgaden. While there, Lipton became acquainted with Ferdinand Porsche (responsible for the Panther and Tiger tanks), who could speak English very well. They ate their meals together while Porsche was at the POW camp L.A.G.A.R. Lipton remained with Easy until the end of the war, up until Easy Company was disbanded (after the official surrender of the Japanese and the Germans). He remained in the army reserves through the Korean War, but was not deployed overseas again. Upon Carwood’s return to the United States, he enrolled at Marshall University and completed his final three years graduating with a degree in Engineering. Fresh with his degree in Engineering, Carwood got a job with Owens Illinois Inc., a manufacturer of glass products and plastics packaging. He rapidly advanced in the company and by 1952 he had become Chief Operator. In 1966, he moved to Bridgeton, New Jersey where he became an Administrative Manager, and in 1971, he and his wife moved to London where he was the Director of Manufacturing for eight different glass companies in England and Scotland for several years. In 1982, he moved to Toledo, Ohio and retired a year later from his post as Director of International Development. own veteran commentary on the popular HBO miniseries Band of Brothers and the inspirational true story of Easy Company, We Stand Alone Together: The Men of Easy Company. 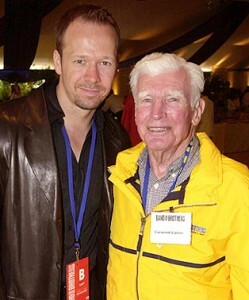 Carwood was portrayed in the Band of Brothers miniseries by Donnie Wahlberg. C. Carwood Lipton died on December 16, 2001 of pulmonary fibrosis in Southern Pines, North Carolina. His death was a great loss to the remaining veterans of Easy Company and he will always be remembered as one of the greatest Easy Company soldiers. © 2017 C. Carwood Lipton. All Rights Reserved.